paul gregutt's washington wine blog – unfined & unfiltered: happy anniversary cold creek! This harvest marks the 40th anniversary of Chateau Ste. Michelle’s Cold Creek Vineyard, one of the oldest and most iconic vineyards in Washington state. When the vineyard was planted in 1973, it helped establish Washington as a major American grape growing region. It comprises 811 acres, located in a remote, arid and desolate area of Eastern Washington. That may sound like a description of the vast majority of vineyards in this state, but here it really applies. Cold Creek is 38 miles east of Yakima and south of the Columbia River and the Wahluke Slope. There is I believe one other vineyard nearby. Other than that, scrubland as far as the eye can see. In the second edition of my book, Washington Wines & Wineries: the Essential Guide, I singled out Cold Creek along with a handful of other vineyards worthy of special recognition. (Oddly, a majority of them begin with the letter ‘C’!). I wrote: “The first vineyard-designated wine made in Washington state was a Cold Creek Cabernet Sauvignon, back in 1978. The drive to Cold Creek doesn’t look much different now than it did 30 years ago. Heading east from Yakima on Highway 24, you pass fields of hops, cattle pens, and sheep ranches. There are few if any wine grapes along the drive. Suddenly, a broad expanse of well-tended vines appears on the left, draped across a gently sloping hillside: Cold Creek Vineyards. “Cold Creek, time has proven, is an ideal grape-growing site, with 35+-year-old vines planted in light, silty, well-draining soils. It benefits from some of the warmest and sunniest summer weather in the state, and it sits on a slope that makes it virtually impervious to frost. 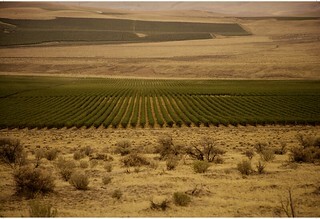 During the freeze year of 2004, many small (and not so small) Walla Walla wineries, having lost their usual grape sources to the cold, were able to compensate with fruit from Cold Creek, which ripened a full crop. “As in much of Washington, the soils here harbor no significant insect pests, one reason the original block of cabernet, which went into the ground in 1973, is still bearing, some of the oldest cabernet vines in the country. The tough, rugged vines are own-rooted and fan-trained, and the grapes go into a wide variety of Ste. Michelle’s best wines, along with up to half a dozen vineyard designates. Cold Creek fruit, especially its Riesling, Chardonnay, Merlot, and Cabernet, has been the lynchpin for the Artist Series reserves, the Col Solare reds, the Northstar merlot, the Ethos reserves, and some vintages of the Eroica Riesling. Among current, designated Cold Creek Vineyard releases I can particularly recommend the Chateau Ste. Michelle 2011 Cold Creek Vineyard Chardonnay Columbia Valley ($25); the Chateau Ste. Michelle 2012 Cold Creek Vineyard Riesling ($18); and the Chateau Ste. Michelle 2010 Cold Creek Vineyard Merlot ($26). All are 90+ wines that deliver value well above their price points, and have the potential for cellaring. One of the wines that really got me into wine was a CSM Cold Creek Cabernet. It had such great complexity and depth that I couldn't put it down. I've got several vintages waiting for me in the cellar, I might have to crack one open just for the heck of it. It's also Salmon-Safe and L.I.V.E. certified!